SAN FRANCISCO: As the SUV war heats up, with at least 20 new models waiting to be introduced over the next year, automakers are trying to outdo each other with each new launch by making their respective vehicles bigger, better, stronger and safer than the other guys products. At General Motors, that mantra holds especially true for their all-new mid-size SUVs: the Chevy TrailBlazer, the GMC Envoy and the soon-to-be-defunct Oldsmobile Bravada. We had a chance to drive a two-wheel-drive TrailBlazer LT at a recent junket to Branson, Missouri, and we were quite impressed with the entire vehicle. 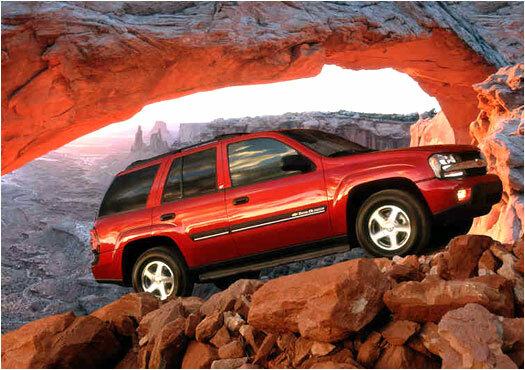 Inside, TrailBlazer is larger than the Blazer it replaces by leaps and bounds in every area. We found the seats to be comfortable, with plenty of leg and shoulder room for all passengers. The controls were stock GM, while not bad, we were hoping for a change in the GM corporate paradigm. During our stay in Branson, we were treated to a couple of presentations on the new vehicle and some of the goodies the designers and engineers had put in to it. The engine in the TrailBlazer is worth a note of praise. GM engineers have resurrected the domestic inline six-cylinder and have made it fuel efficient, quite and powerful. The engine has 90 percent of its peak toque available from 1600 to 5600 rpm, it uses variable valve timing and throttle-by-wire to help achieve national LEV standards and it is extremely quiet. The idle is so smooth that even senior engineers tried to restart it. Because of this, there is a starter lock on the production model to prevent damage to the starter and flywheel. The 4.2-liter inline-six in the TrailBlazer deliveries 270 horsepower and 275 lb.-ft. of torque. For comparison, the 2002 Explorer V8 makes 240 horsepower and 280 lb.-ft. of torque; a difference of 30 horsepower and 5 lb.-ft. in Chevys favor. The TrailBlazer should beat the Explorer at mileage as well. The estimated mpg for the TrailBlazer is 16 city and 20 highway, whereas the Explorer V8 is rated at 14 city and 19 highway. Not a really big difference but its enough of one for Chevy to proclaim superiority. The maximum oil change interval for the new engine has been extended to about 15,000 miles or just about double what every other manufacturer specifies. The engineering team was able to do this by using new oil temperature control technology. Another instance where Chevy can claim the upper hand against the competition. Innovations abound with these new SUVs. Engineers decided to mount the engine lower in the engine bay for a lower center of gravity and better stability. To do this, the a pass-through was made in the oil pan for the front drive shaft to go through, and at no cost to driveability. The good thing about a straight engine configuration is that one side is hot (exhaust) and one side is cool (intake), making packaging decisions easy. They put all the electronics and temperature sensitive equipment on the cool side and everything else was positioned on the hot side. This extends the life of the components and aides in accuracy of the computer equipment, which is extremely sensitive to heat. The hood on the TrailBlazer is made of bake-hardened steel. The hood hardens in the paint booth under the baking lights to help in crash worthiness and durability. The newest rallying cry at GM is the use of hydroforming on structural pieces and frame rails. This process produces superior integrity and strength to the molded pieces and helps suspension engineers by giving them a stronger structure on which to mount the suspension pieces. To make the frame rails, a piece of steel is put into a die and water, compressed to 50,000 psi, is shot at the steel to force it into the shape of the die. The end product comes out of the die better than with any other technology. Hydroformed rails can be found on newer GM cars and trucks, including the Corvette and the recently redesigned Silverado and Sierra trucks. The engineers claim that the entire TrailBlazer structure is as strong as a European sedan because of this new technology. The 4X2 TrailBlazer LT performed flawlessly on a drive through the hills and valleys of the Ozark Mountains, which is probably why the staff picked those roads for us. We were quite impressed with the comfort level and driveability of this new vehicle. We were even impressed with the off road ruggedness of the two-wheel-drive model we were driving. The staff led us onto an old logging road just before lunch. The terrain led us up and down through the hills and the rocky road gave us an appreciation of the new chassis and suspension. Not once were we afraid of getting stuck; though one group just ahead of us got caught on a tree limb. Luckily, they were in a 4X4 and were able to clear the obstacle and warn the rest of us about it. or those times you need peace and quiet and have to go out to your vehicle to find it. It is the first DVD in a mid-size SUV offered as original equipment. You can get a two-wheel-drive TrailBlazer LS for just $25,155.00, while the top-of-the-line four-wheel-drive LTZ will start at $33,730.00. Expect a large amount of standard items on the base models and high-end bits like the aforementioned DVD player to be available for you to customize the vehicle as you see fit. Since the TrailBlazer and its cousins are such new models, there have been no crash tests performed by the regular agencies. In an interesting turn of events, the Blazer, which the TrailBlazer will eventually replace, will be sold through the 2003 model year, because of strong sales, according to GM press materials .